This entry was posted in myopera, rambling and tagged blogging, my opera, myopera. Bookmark the permalink. Wow, I wish I’d been able to keep that many of mine. I waffle on, it seems. You waffle well. I enjoy. Maybe, but I haven’t quite managed to ice cream and caramel sauce myself yet. Everyone knows a plain waffle just isn’t the same. 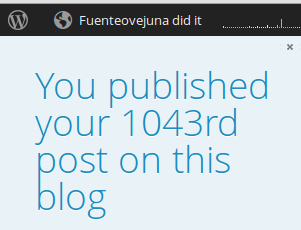 The important thing is whether they are 1043 good posts…and they sure are. There needs to be a book published that is based on your blog!